This week, I spent a very enjoyable few days in Bern, Switzerland, attending the conference ‘Thinking about Space and Time: 100 Years of Applying and Interpreting General Relativity’. Organised by Claus Beisbart, Tilman Sauer and Christian Wüthrich, the workshop took place at the Faculty of Philosophy at the University of Bern, and focused on the early reception of Einstein’s general theory of relativity and the difficult philosophical questions raised by the theory. The conference website can be found here and the conference programme is here . Of course, such studies also have a historical aspect, and I particularly enjoyed talks by noted scholars in the history and philosophy of 20th century science such as Chris Smeenk (‘Status of the Expanding Universe Models’), John Norton (‘The Error that Showed the Way; Einstein’s Path to the Field Equations’), Dennis Lehmkuhl (‘The Interpretation of Vacuum Solutions in Einstein’s Field Equations’), Daniel Kennefick (‘A History of Gravitational Wave Emission’) and Galina Weinstein (‘The Two-Body Problem in General Relativity as a Heuristic Guide to the Einstein-Rosen Bridge and the EPR Argument’). Other highlights were a review of the problem of dark energy (something I’m working on myself at the moment) by astrophysicist Ruth Durrer and back-to-back talks on the so-called black-hole information paradox from physicist Sabine Hossenfelder and philosopher Carina Prunkl. There were also plenty of talks on general relativity such as Claus Kiefer’s recall of the problems raised at the famous 1955 Bern conference (GR0), and a really interesting talk on Noether’s theorems by Valeriya Chasova. My own talk, ‘Historical and Philosophical Aspects of Einstein’s 1917 Model of the Universe’, took place on the first day, the slides are here. 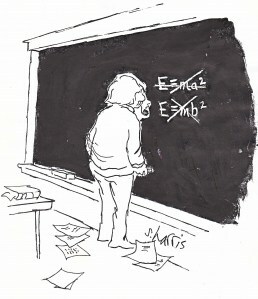 (It’s based on our recent review of the Einstein World which has just appeared in EPJH). As for the philosophy talks, I don’t share the disdain some physicists have for philosophers. It seems to me that philosophy has a big role to play in understanding what we think we have discovered about space and time, not least in articulating the big questions clearly. After all, Einstein himself had great interest in the works of philosophers, from Ernst Mach to Hans Reichenbach, and there is little question that modern philosophers such as Harvey Brown have made important contributions to relativity studies. Of course, some philosophers are harder to follow than others, but this is also true of mathematical talks on relativity! The conference finished with a tour of the famous Einstein Haus in Bern. It’s strange walking around the apartment Einstein lived in with Mileva all those years ago, it has been preserved extremely well. The tour included a very nice talk by Professor Hans Ott , President of the Albert Einstein Society, on AE’s work at the patent office, his 3 great breakthroughs of 1905, and his rise from obscurity to stardom in the years 1905-1909. All in all, my favourite sort of conference. A small number of speakers and participants, with plenty of time for Q&A after each talk. I also liked the way the talks took place in a lecture room in the University of Bern, a pleasant walk from the centre of town through the old part of the city (not some bland hotel miles from anywhere). This afternoon, I’m off to visit the University of Zurich and the ETH, and then it’s homeward bound. Imagine taking a mountain lift from the centre of town to lectures! Earlier today , I gave my first my undergraduate lecture at University College Dublin (UCD). The lecture marked the start of a module called Revolutions in Science, a new course that is being offered to UCD students across the disciplines of science, engineering business, law and the humanities. As far as I know, this is the first course in the history and philosophy of science (HPS) offered at an Irish university and I’m delighted to be part of the initiative. I’ve named my component of the module Science, Society and the Universe – a description of the evolution of ideas about the universe, from the Babylonians to the ancient Greeks, from Ptolemy to Copernicus, from Newton to Einstein (it’s a version of a module I’ve taught at Waterford Institute of Technology for some years). Hopefully, the new module will be the start of a new trend. It has long surprised me that interdisciplinary courses like this are not a staple of the university experience in Ireland. Certainly, renowned universities like Harvard, Oxford and Cambridge all have strong HPS departments with associated undergraduate modules offered to students across all disciplines. After all, such courses offer a very nice mix of history, philosophy and science, not to mention a useful glimpse into the history of ideas. It’s hard to believe we have almost reached the end of the second teaching semester. I’m always a bit sorry to see the end of classes, but I accept that it’s important that students are given time to reflect on what they have learnt. With that in mind, I don’t quite understand why exams start in early May rather than June. As regards research, I can now get back to putting the finishing touches to a review paper I have been trying to finish for months. Mind you, thanks to the open-plan layout of offices in our college, there will be more – not less – noise and distraction for the next few months as staff are no longer in class. Whoever came up with the idea that open-plan offices are a good idea for academics? On top of finishing off my various teaching modules, I agreed to give a research seminar this week. The general theory of relativity, Einstein’s greatest contribution to science, is a hundred years old this month and I couldn’t resist an invitation to give a brief history of the theory, together with a summary of the observational evidence supporting many strange predictions of the theory – from black holes to the expanding universe, from the ‘big bang’ to gravitational waves. The talk took quite a bit of prep, but I think it went well and there were plenty of questions afterwards – a nice way to finish off the teaching semester. I gave a similar talk in University College Dublin yesterday. A tiring trip, but it’s always very satisfying to give a repeat performance.